This guy sets up on the SE corner of Yonge & St Clair most afternoons, and plays endless variations on the above recording. He’s playing an autoharp with the chord bars removed, and run through a homebrew battery-powered amplifier with much reverb and distortion. A bunch of the burbly noises are 8kbit/s voice recorder artifacts from my phone. Although the themes seem repetitive, I don’t think they repeat exactly every time. He seems to be in a happy place playing them. She whistles, plays autoharp, and lives locally: Linda Parker Hamilton — The Northern Nightingale. 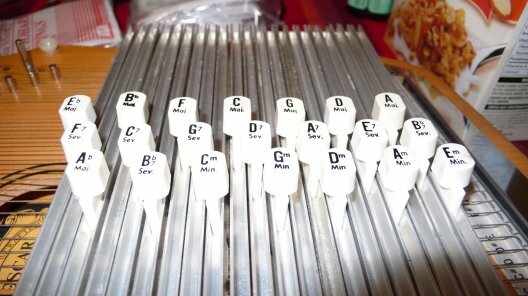 After ferrying Catherine around for another exciting adventure in LibraryQuest, we took my autoharps to Appalachian Instruments in Oakville for a repair. I have half expecting Bob to declare at least one of them a junker, but apparently they’re more than salvageable. Indeed, the older Type A is apparently a rather nice 1950s wood-bar black felt Silvertone, and the Type B, despite the warped top, is a good little player except for a couple of weak springs. Bob’s busy repairing and generally refurbing them, and we should get them back in a week or two. Should we form an autoharp folk duo? Bob’s the local luminary of the autoharp, and has many models and spares in stock. It’s best to leave a message on the store’s phone, as he’s not always there. He also teaches, and does house calls. Update: Bob advised of a change of address. Sad to hear that Oliver Postgate passed away. Bagpuss was my series; it started just as I started school, and I caught the first episodes. I spent the whole evening learning the theme on the mandolin, and watched a couple of episodes, half-teary. Was it really nearly 35 years ago? The music and sounds are what stuck with me. I didn’t know it at the time – but did as soon as I picked one up – that the Bagpuss waking up magic sound is a slow upwards glissando on an autoharp. Similarly, the falling asleep sound is an autoharp strummed slowly downwards. Gabriel’s instrument confused me for years – I now see it has a 5 string banjo neck, but no fifth string (like someone else I could name). To add further confusion, it’s really a mandolin that’s Gabriel’s sound. 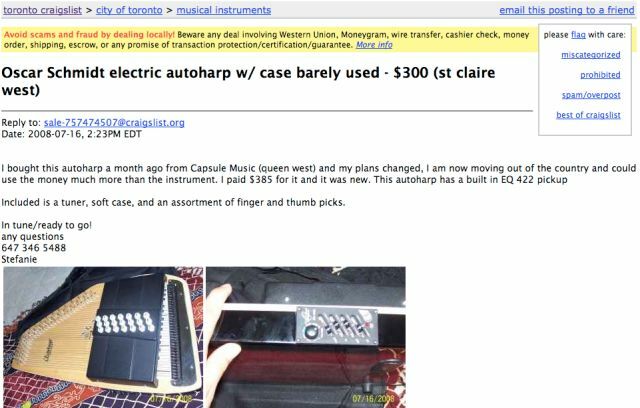 … all wasted waiting for a silly wee lassie who’d agreed to meet to sell an autoharp, then sold it out from under me. Pleasantly surprised that a local store – Scarboro Music, at Vic Park and Kingston has autoharp strings. It also has a very fine old Dobson banjo for $1500. Pleasantly surprised that a local store – Scarboro Music, at Vic Park and Kingston has autoharp strings. 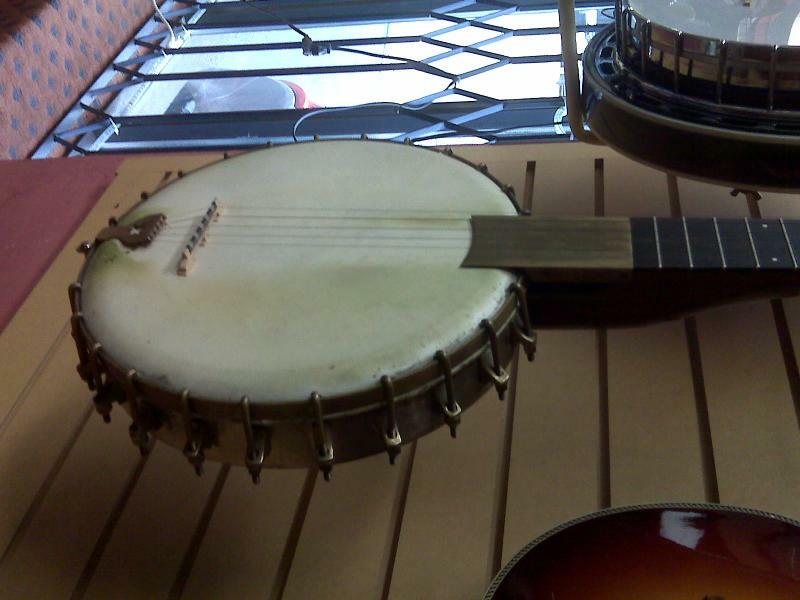 It also has a very fine old Dobson banjo for $1500. Author scrussPosted on 02008-06-18 02008-06-19 Categories banjo, choonsTags autoharp, banjo, music, scarboroughLeave a comment on supplies! I got an autoharp on eBay a couple of weeks back. It was cheap, but fairly beat up. 32 of the 36 1970s-vintage strings were intact, if very tarnished. I spent more on new strings and a tuning wrench at Elderly last weekend. After spending a few evenings cleaning (you don’t want to know what I found in it), replacing strings (fiddly) and tuning (slow), I can now make 1970s sounds. Fun!